Join us in our new home as we celebrate the amazing space our archive has moved into, and take a moment to pick up some holiday gifts! 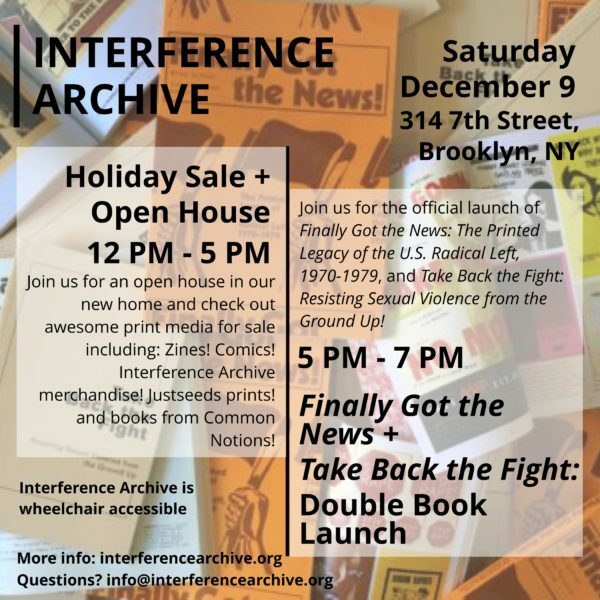 In addition to all your favorite Interference Archive merchandise, our friends from Justseeds Artists Cooperative and Common Notions will be joining us to sell prints and books. Comics, zines, and posters, will be for sale from the Our Comics, Ourselves crew. We’re also excited to announce that, following our mid-exhibition move, Take Back the Fight: Resisting Sexual Violence from the Ground Up is now on partial display in our new home. And, you can join us later in the afternoon for a joint book launch of the two publications we put out while packing and re-building Interference Archive this summer — check out our website for all the details on our Finally Got the News and Take Back the Fight Double Book Launch from 5-7pm!